Window graphics, decals, vinyl displays … these flexible printing options give powerful impact across an almost infinite number of uses. Moving into new offices? Opening a new hotel, restaurant, or bar? Have a seasonal sale to promote in your retail space? 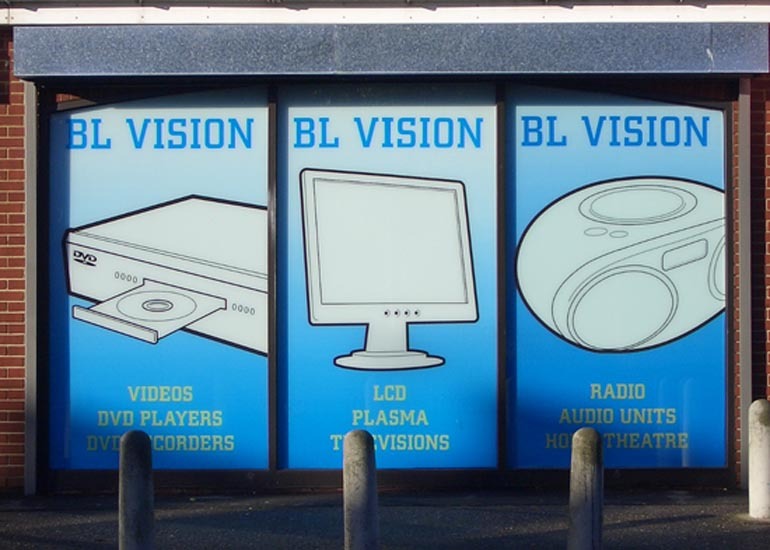 Custom-printed graphics for your windows get eyes fixed onto your business. “From the same window, you keep seeing the same view.” The Turkish author and playwright Mehmet Murat Ildan surely had travel in mind when he delivered this philosophical quote, but you needn’t necessarily change your location to change your outlook on life. As new technologies and innovations in materials bring down the costs of splashing your message across vast window spaces, window graphics have never been better quality nor better value. If you keep seeing the same view, change it. Use window graphics to stop people in their tracks. By their very nature, windows are often the most noticeable part of your business’s façade—they frequently occupy large swathes of visual real estate. In an age where attentions are pulled in thousands of different directions, you need to maximise your visibility. From simple graphics to high-quality photography, whatever your business or brand, window graphics will stop crowds in their tracks. Inexpensive, functional, and versatile, vinyl graphics and window decals can bring life to practically any smooth surface; not simply storefronts or business windows, think busses, cars, shelters, and temporary constructions in prominent locations. As technology progresses and materials cheapen, vinyl graphics can go from windows to floors, even serve as temporary wallpaper for construction hoarding or become pavement or road graphics. Only imagination limits their use. The versatility that every marketer demands. With the boundless versatility that these vinyl graphics and window decals offer, marketing creatives will be buzzing with ideas for potential applications. 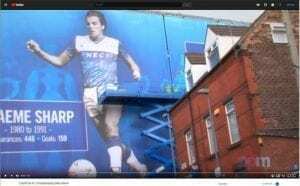 Custom printed graphics in highly-visible locations is a dream for those in control of strong and innovative brands; bringing high streets or bustling entertainment areas to life, maximising impact to increase both brand awareness and sales potential. What’s more, the nature of flexible printed vinyls means they can easily be stored and reused for future marketing campaigns. Window graphics are easy to put up and take down again, and if you want to change the copy or design of an existing job, it can take just minutes to update the original file and make amendments. With vinyl graphics, there’s no need to create new signs from scratch time and time again—meaning that value for money accompanies versatility and brand awareness in the host of plusses that come with creating window graphics for your business. 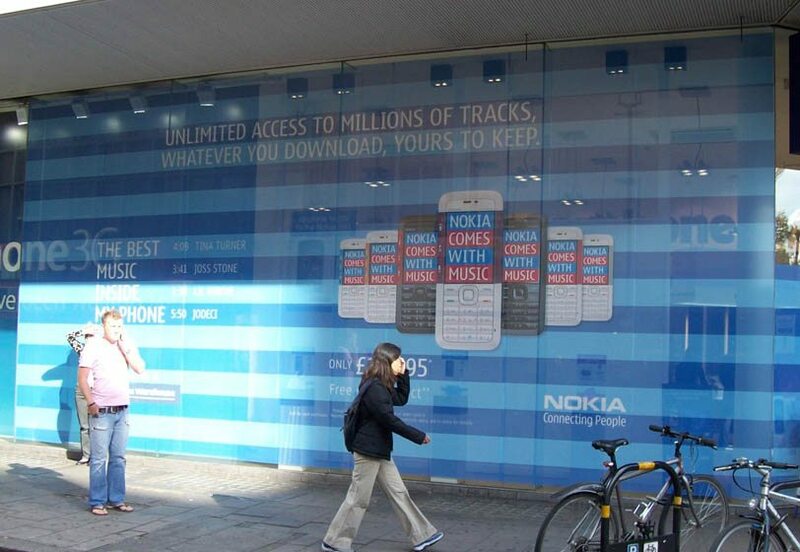 All the ingredients needed for successful and ongoing marketing communications are here, introducing window graphics into your brand strategy really is a no-brainer. Create an immersive environment for your space. With imagination the only prohibiting factor in what window graphics can do for you, think outside the box … brand awareness is vital at every step of the way, but that doesn’t mean that your vinyls or decals need be always be in-your-face marketing tools. By covering the windows of your property with heavily-stylised graphics, your environment can be dramatically transformed. Be it retail space, hospitality venue, office, or lifestyle destination, floor-to-ceiling graphics can transport your customers or clients to another world. Instead of employees feeling as though they’re in a goldfish bowl every time the public walk by, they could actually be in a goldfish bowl; playful graphics catching the eye, but also changing the atmosphere of the environment indoors. A city centre gym might want to immerse its clients in a rugged outdoors world, inspiring would-be rock climbers or mountain bikers; whilst the owner of a tapas restaurant in regional England could whisk their diners straight off to the Mediterranean. It’s not a case of what should we do, but of what shouldn’t we do? High quality and durability that suits any given environment. Whatever the application of your versatile window graphics. Management’s dedication to seeking out the very best quality at the very best prices means you can trust the durability of your product. Able to withstand the effects of prolonged exposure to sun, rain, wind, or snow, vinyl window graphics are suitable for any environment; which is great news for those wanting to decorate windows throughout the United Kingdom. Using pigments in the solvent ink which is mixed to create the self-adhesive vinyl prints, your custom designs—from bold contemporary graphic design to emotive and engaging photography—can be assured to last long; commonly using UV ink, these vinyl banners are also protected from the sun’s harmful rays, water, and humidity. And it’s not just the graphics on the outside that is protected with this sort of treatment. Did you know that, with long enough exposure, you can still got sunburnt indoors? Ordinary glass only translates to an SPF factor of 30, you know the effects sun can have, so think about the furniture or other marketing materials sitting behind it in the same place every single day; on top of keeping spaces cool and comfortable for people on the inside whilst wooing passers-by on the outside, window graphics can significantly add to the longevity of all manner of objects and decorations. Window graphics enhance safety, too. Ever wondered why those rows of dots appear on windows in public spaces? Because the have to. A legal requirement for clear glazing in certain spaces—where glass doors, windows, partitions or translucent walls may have many people moving around and in between them, for example—window manifestations are two bands (one for adults, another for children, small adults, or wheelchair users) that can include a decorative feature such as corporate branding or brand identity iconography. Typically taking the form of a frosted film, Project Print Management can help advise on regulations and requirements, as well as assisting you in making the most of window manifestations—why use plain shapes or patterns when your brand identity has the chance to shine? As well as consultation, expect PPM to help you get the best materials, the best print job, and the very best price at every step of the way. Whether it’s window graphics or floor graphics, the technologies and the materials used in making such impactful marketing materials has progressed in such a way they make for a cost-effective way to convey brand messaging. With digitally-printed design and streamlined production, the process of producing vinyl graphics has simplified; requiring less expense and resources. Harness the power of a key value-for-money component of any successful marketing campaign; enjoy their versatility and impact; create immersive experiences; and trust in their longevity. Allow PPM to guide you through the myriad of options and make the right choices for the right job. Don’t stick with the same view, make a change today. For more our latest projects please visit our blog page.